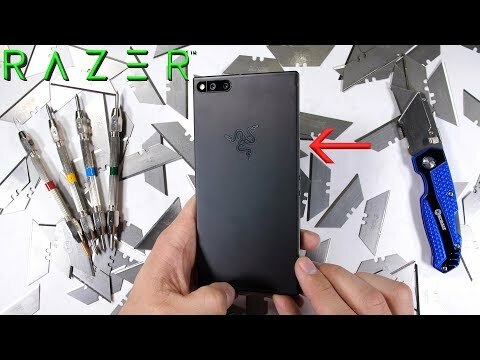 Razer Phone Just Passes JerryRigEverything's Durability Tests - AndroGuider | One Stop For The Techy You! When JerryRigEverything tested the Nextbit Robin last year, the phone snapped into two pieces during the bend test. Nextbit was acquired by Razer earlier this year and the gaming company recently out its first phone. The outer design of the Razer Phone closely resembles that of the Nextbit Robin; in fact I would say that the Razer Phone is reminiscent of the Robin. Unlike the Robin which was entirely made of plastic, the Razer Phone is built of metal. The metal build strengthens the Razer Phone so much that it is leaps and bounds ahead of the Robin in durability even though both the phones share a similar design language. JerryRigEverything, also known as Zack, starts with the scratch test. The Gorilla Glass 3 backed 120Hz display of the Razer Phone starts scratching at a level six, which is on par with other top of the line smartphones. As previously mentioned, the Razer Phone is made of metal and that is confirmed when Zack scratches his blade on the Razer Phone's body. The power and the volume keys are also made of metal. The fingerprint scanner which is built into the power button continues to function even after being heavily scratched. Things start to get messy as Zack flips the phone to its back. The rear dual camera lens gets easily scratched by JerryRigEverything's blade. Zack concludes that although the lens appears to be made of glass, it appears to have some coating over it which is resulting into the scratches. The metal back of the phone also gets scratched easily and unlike the OnePlus 5T, the scratches don't wear off. In the burn test, the pixels of the Razer Phone turn black after being exposed to hear for a prolonged time but slowly recover. This time around JerryRigEverything didn't mention how long the screen lasted before the pixels started turning black. When the Razer Phone was bent on its screen, there was a noticeable flex and the power button almost popped out. On being bent on its back, the volume button snapped, but the phone doesn't fail catastrophically as the Nextbit Robin. So the Razer Phone does pass the durability test, but only by a feather. JerryRigEverything recommends using a case or a skin to protect the phone from scratches on its back and camera lens.